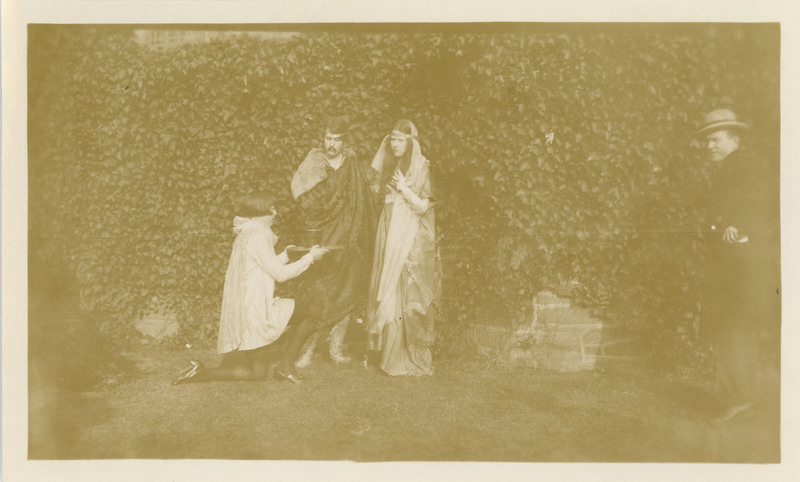 MBS (in costume, with moustache) acting in a play as part of the Rockefeller Christmas festivities in 1924, the year she was Warden. While the East remained her eventual intended path, she spent the first years after her graduation pursuing other experiences closer to home. She had three years to fill before she would be old enough to meet the Presbyterian Mission Board's criteria for international service--nevertheless, MBS found a way to foster both her religion and her avidity for activism and women's rights, serving as secretary to British preacher and suffragist Maude Royden on a traveling lecture series. The following year (the 1923-24 academic year) she took her first teaching position as Instructor of English at Sweet Briar College, a job that she discovered that she both enjoyed and had a natural aptitude for. With her remaining year, she returned to Bryn Mawr to do graduate work while serving as Warden in Rockefeller. Three years after graduating, MBS was old enough to travel abroad with the Presbyterian Mission Board. She was invited to teach English at Yenching University, in Peking, and she left the United States to do so in 1925.